The menu for the evening had our mouths watering as soon as we looked at the handout. Chef Suzanne introduced us to the ingredients by sending a sample around. 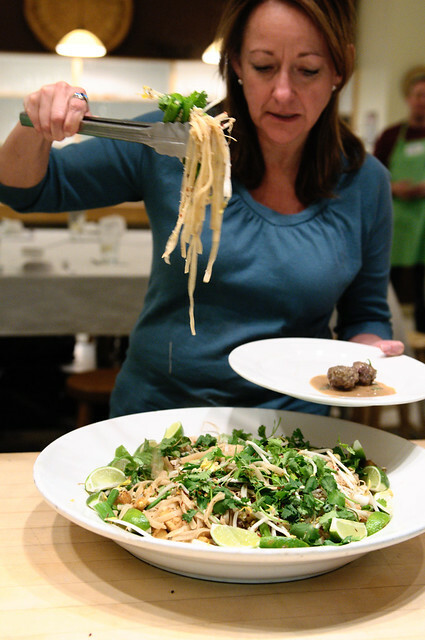 We were then divided into two teams of seven each and the menu was split between us, with both teams making Pad Thai. What I loved hearing was that we were going to work with dried shrimp and fish sauce was a necessary ingredient. Yes! Both ingredients that are usually missing in Thai restaurant food. 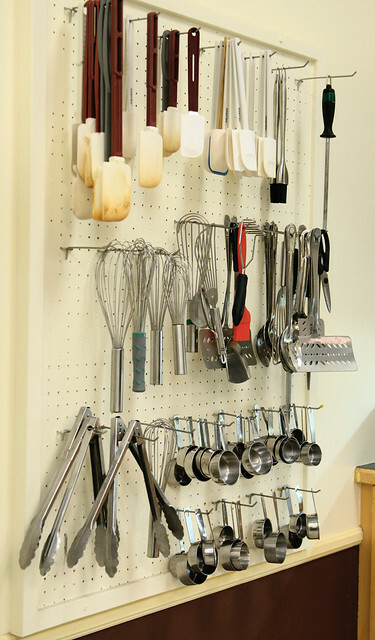 As I looked around me, I quickly realized that tall people definitely had a decided advantage in this kitchen. I confirmed that soon enough while frying dried shrimp and dried red chiles, and while tossing the rice noodles for Pad Thai. The students were from all walks of life. Some came in twos, like Teri and I. There was a mother-daughter duo and also a young couple. (CSR gives you and your friend a 15% discount for registering together, which I think is pretty cool!) One participant drove all the way from Colorado Springs for this class! Suzanne is a trove of information, constantly sharing nuggets about techniques as well as her experiences on her travels through Asia. At one point, she figuratively rapped me on my knuckles for fussing over the shallots and garlic that I was frying. Oops! 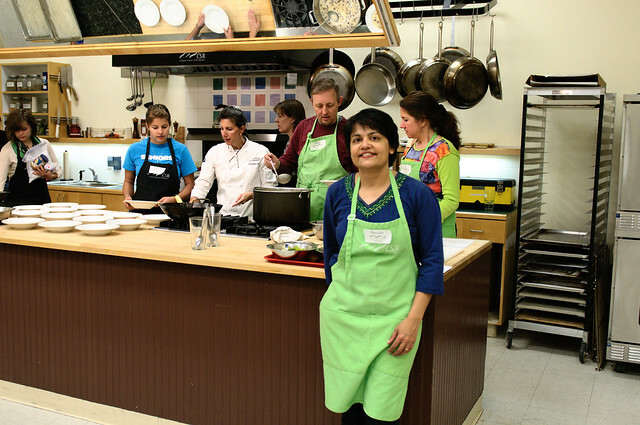 I had to stop myself from working the way I do in my own kitchen and change my mindset to being in a commercial kitchen, cooking for 18 people. 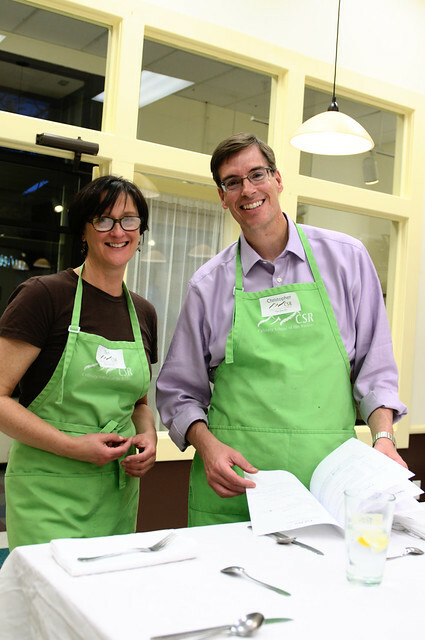 We ate each course after cooking it, discussing the finer nuances of each dish with Suzanne as we filled our bellies with yummy goodness. There were subtle flavors and there were bold flavors. Most of all there was fish sauce; it smelled strong but added a new layer of flavor that is not easy to describe. 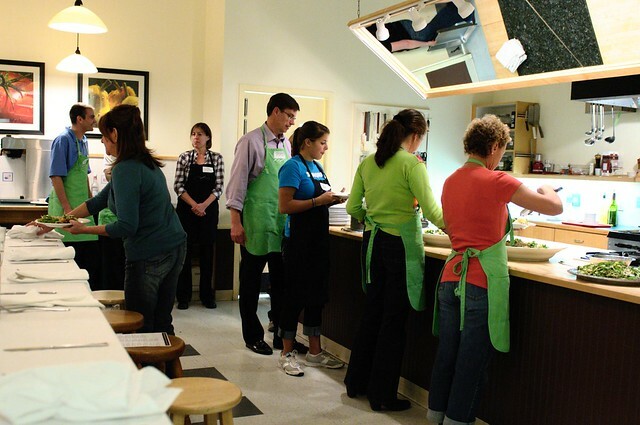 I learned so much in this brisk-paced yet fun cooking class! It helped familiarize me with ingredients that I have previously hesitated to buy, despite loving Thai flavors. It also helped build my confidence in understanding what I could do to enhance the tastes that I seek in Thai food, without losing authentic flavors. The recipes were either from the cooking classes that Suzanne takes every time she visits Thailand or from street vendors. I am not much of a fiend for desserts. I will take spicy and savory over sweet any day. But this dessert from the streets of Thailand is delicious and very easy to make. That it has mango made it even more attractive but Suzanne stressed that we could attempt this with other fruit like peaches and even berries. 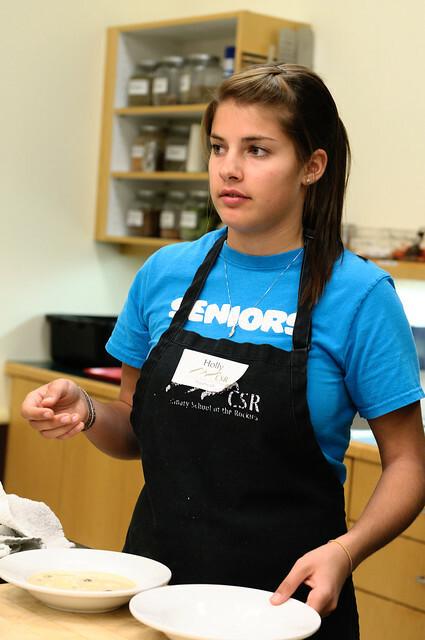 Thank you, Chef Suzanne and CSR, for an enjoyable learning experience! Soak the rice in 1 cup water for about 20 minutes or up to 1 hour. Do not drain the rice. Instead add 3/4 cup more water. Also add 1 tbsp brown sugar, 1 tsp salt and a tad less than 1/2 cup coconut milk. Bring to a boil, and then partially cover the pot with a lid, leaving some for the steam to escape. Reduce heat and simmer for about 15-20 minutes, or until all the liquid has been absorbed. Turn off the heat, cover the pot properly and allow it to cook in its own steam on the burner for another 5-10 minutes. In a small saucepan, dissolve tapioca starch, 1/4 cup sugar and a pinch of salt in the rest of the coconut milk. Warm this mixture over medium to low heat, making sure that it does not boil. Using the nappé test, confirm that the sauce has thickened adequately before taking it off the heat. Using a small ice-cream scoop, place small scoops of the rice into dessert bowls. Pour about 2-3 tbsp of the warm coconut sauce over the rice. Add mango pieces and serve. This can be enjoyed warm, at room temperature or chilled. 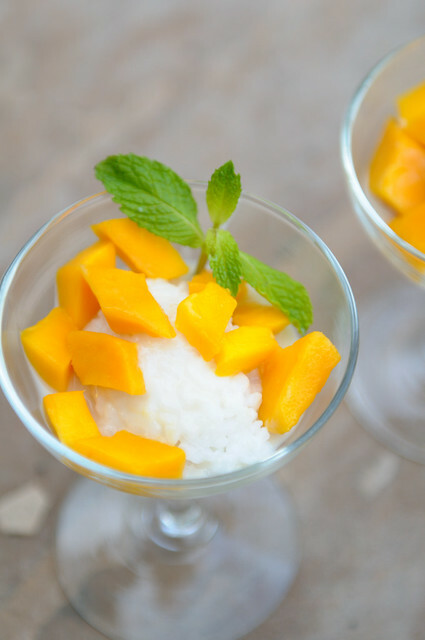 When serving, pass around more mango pieces and coconut sauce, should anyone want more. I always do! I cheated a little bit with the sticky rice. I bought cooked sticky rice that only needed to be reheated. My excuse is that the nearest Asian market is very far away! I added sugar and coconut to the cooked sticky rice and warmed it again in the microwave. If you choose not to follow my shortcut, do not skip soaking the sweet rice. Soaking softens the tough outer shell. If you do not soak it, you will in all probability end up with hard rice. Sticky rice tends to harden faster than regular rice so it's a good idea to consume it within a day or two of cooking it. Avoid lite coconut milk. Buy quality coconut milk so that you get the best flavors. If you don't have tapioca starch, you could substitute with corn starch. However, the sauce will not be as glossy and may separate on refrigeration. Dissolve corn starch in some cold water, removing all lumps before adding it to the coconut milk. Do not boil the sauce as it is likely to curdle with a loss of coconut flavor. Add more sugar to make the sauce sweeter or add more coconut milk if you find it too sweet. The only problem with the latter is that you might have just used up the only can of coconut milk you have! In which case, the better thing to do is to add a little less than 1/4 cup sugar and add the remaining only if you think you need it. Remember though that the sauce will taste less sweet once it is poured over the sticky rice. Oh please please share the recipe for the tom kha gai (along with brand names for the ingredients too! )Yummmmmmmmm, my mouth is watering already. Pad Thai looks lovely.Wish your classes were closer! Can see you had a gastronomic time:). My version however has lot of coconut milk almost bringing it to the consistency of kheer. I still have to try with authentic Thai sticky rice at home. I like the simple presentation too. To say that all American Thai restaurants avoid using fish sauce, dried shrimp and paste (and crab paste, fish paste, etc) would not be quite accurate. And then, across town in a little strip-mall, there is an unassuming Thai cafe (they might serve beer) run by a mother-daughter team. They don't skimp on any of the ingredients (though they do serve the non-oily tom yum gai/goong which I can't help but hold against them); they also have a larger menu than what suddenly appears in front of you when you sit- if you were to ask! ;-) The place is heavily-frequented by the local Thais and Laotians who chatter away in their native tongues. The food is phenomenally good- and gorgeously presented! They serve both som tam and tam som (if you're in the know, you'll know what I mean). So, all that glitters... is the key- could be. Cooking, eating- sounds like you had a grand time! I would love to take a Thai class one of these days if I can find one nearby. Cooking and eating each course sounds so gourmand. The sticky rice reminds me of our Jessel bhat minus the saffron and cardamom and the spices. Ok, this is totally different. Discovered fish sauce thanks to some encouragement from Mark Bittman (who used it in a 'minimalist' recipe) and a thai relative who gifted me a bottle. I think I'm quite addicted to the stuff, and use it with ketchup to get my sure-shot indian-chinese fix. It leads to the street-side strength umami we crave. You're encouraging me to try the dried shrimp etc as well...maybe when I stop being lazy! I have come across this dessert many times in blogsphere and always tempted to try. Now that I see it here, its that last boost I wanted to get! Looks like a fun class btw. Miri, in general, people are afraid of new tastes and flavors although that is changing quickly. Fish sauce is an ingredient that is usually added by request, especially in our area. Another reason may be that there are a lot of vegetarians and vegans in this area. I'm just guessing. My friend Teri is working on perfecting the Pad Thai recipe. Once she has it down pat, I will just steal it from her! A lot of people swear by Jaden's recipe (Steamy Kitchen) but Teri said Pad Thai paste is an ingredient in that recipe, and neither of us have a clue what that is. I found this interesting: "I always find it amusing when restaurant reviewers judge the quality of a Thai restaurant by the quality of its Pad Thai, as noodles can hardly take claim as lying at the heart of my country's cuisine." From here. Her recipe has a few more ingredients than Chef Suzanne's. GB, I will! I will! I've just borrowed Cracking the Coconut: Classic Thai Home Cooking from my library and I am going to compare the recipes. I would use a lot less chicken than recommended or maybe I was just served a lot of chicken. The soup was very satisfying! Sassy Fork, and I wish all the food you get to sample were closer to me! Sunshinemom, thanks! Most of the online recipes mix the coconut sauce into the rice so it's a thick glutenous mass, without the gluten of course. I like this method because it means I can have more of the sauce and less rice! Torviewtoronto, it's very easy to make! Try it! Pel, did I say all? I haven't been to all. ;-) Of course, it wouldn't be accurate! Most of the Thai restaurants in our area don't use fish sauce, unless you request it. We have to go to specific neighborhoods near Denver to get the authentic stuff! According to this Thai blogger, the tam in som tam means to pound. What changes when it is tam som? Jaya, there were so many different flavors in each course that this was the best way to break it al up and actually remember the experience! Find a class, it's fun! 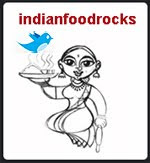 Indu, thanks! This dessert was easy and I knew exactly what flavors I was looking for but otherwise, I need to cook a dish several times before I post so it will be a while. Until then check the two blogs I linked to in my replies above. They might be of some help. Sacredfig, interesting that you should say that! I bought an Indian-Chinese cookbook written by Anjan Chatterjee, chef / owner of Mainland China restaurants in Bombay and he says that there is no fish in fish sauce. I still have to get over that one! I don't know when Pel will be back to drop pearls again but I hope it is soon! Kulsum, it sounds like this dessert is calling your name! It was a fun class. I can't wait to take another class soon! Wow! looks yum! I've thickened coconut milk with corn starch in the past. But it tasted so starchy/powdery. I will try this with tapioca starch. Also, looking forward to your pad thai recipe. Di, I hope you like it! 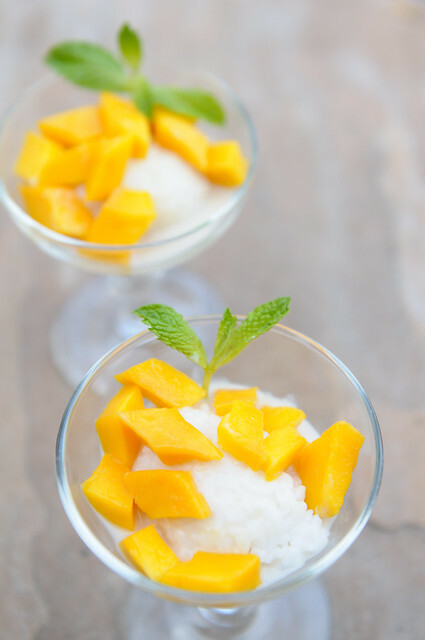 I looked up this dessert some more and found that mango is really the star but I do love the coconut sauce! I also enjoyed this class and the Mango dessert was my favorite! We were so busy that I really didn't get time to know you but LOVE your blog.